From the website: Designing the future for global cities and lifestyles The world today is confronted with a variety of challenges that brings an element of uncertainty to the future of our society. Against this backdrop, 60% of the global population is expected to live in urban areas within 20 years. The urgent issue facing all of us is how we should design cities and the life of people living there. We have recently seen unprecedented development and innovation in infrastructure technologies supporting communications, transportation, environment, and energy. This suggests that we need to rework and transform this sort of urban infrastructure from a new perspective. In addition, quality of life and ambience are now defined based on comprehensive lifestyle, making the underlying creative industries such as art and design more important than ever. Creative industries will leverage their flexible mindset to bring along technological innovations, revisit conventional systems, methods, ways of thinking, and renew our life in many ways. Based on the challenge of "Design the future for global cities and life," we invite global opinion leaders from three industries (i.e. 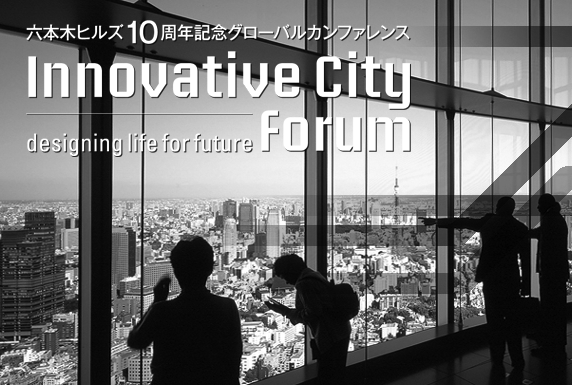 leading-edge technology, creative, and urban policy industries) to hold the Innovative City Forum. We will explore what possibilities are presented by the future human society through lectures based on unique insights and 3-day interdisciplinary discussions. There is no better time than now to design our future!